Apostrophe Catastrophes: I Thought Macy's Had More Class! Horrendous! I gasped. I think I scared the people waiting in line for the dressing room. It's hard to tell from this photo, but the t-shirt has a picture of Woodstock underneath the text. Does Snoopy have something to do with littering? Poor Charles Schulz. He must be rolling over in his grave knowing that this t-shirt is out there soiling the Peanuts name. Becky, I think it's high time you started a blog to point out grammatical mistakes. I really do. It's sad, like worse than pathetic, really, that the apostrophe is misused. Wow, that t-shirt is worse than I am. Oh man, that's just pathetic. I like your ambition. Spread the word baby!! I'm really glad you started this blog. You should post every day. :) I'll mention it in my blog on MySpace too. Oh my god, I love this blog. I'm glad I stumbled upon this while googling... I'm twelve years young and I recently went to the mall with my friends, and noticed that shirt! I was actually in the middle of typing a letter to the company, warning them of the mistake, and then I found this! Great job raising awareness! Mistakes drive me CRAZY! That's great that you are writing a letter to the company! Let me know if they write back. Thanks for your comment! I've credited your blog -- thanks for writing. I'm sorry to sound ignorant, but what am I missing? Where is the abuse of an apostrophe, or grammar, or anything else (other than (technically) incorrect use of capitalisation of "Trash" & "Place")? Genuine question, as it seems to me to be correct use of possessive case in "it's". "It's" means "it is." 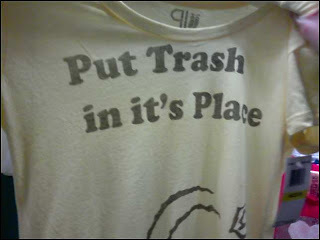 This t-shirt should say, "Put trash in its place." "Its" is already possessive. Think of it as a gender neutral companion to "his." You wouldn't write "his's." There's no t in Schulz. Good catch. I fixed the spelling error. Thanks!